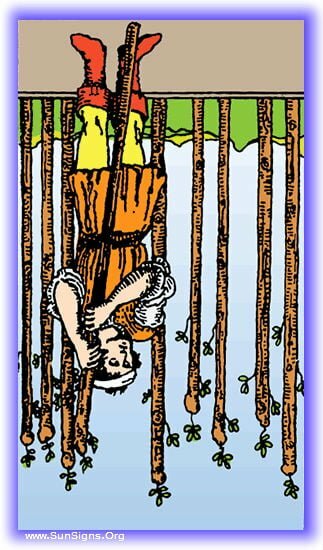 The Nine of Wands tarot card speaks of a last hurdle to be crossed before achieving his dreams. The path traveled, the battle nearly won. The traveler through the Minor Arcana has set his goals, and has persevered through much to reach his final goal. He has not quite arrived, but he has attained all he has and this one final setback will not hold him from his goal. He is injured, tired, but has what it takes to overcome all and keep on his path. 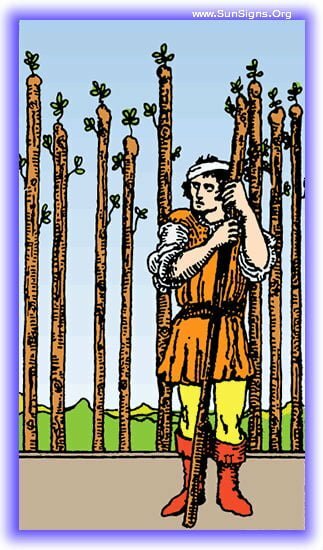 In this orientation the Nine of Wands Tarot card represents having reached one last challenge or setback between himself and his goal. The inner fortitude exists to pull you through, don’t let this obstacle discourage you! You may not know the source of your enemies, and may question your ability to trust those around you, but it’s time to draw on all you’ve learned and push on to the new day. The last obstacle is behind you, it’s been hard, and more than a little bit of a struggle, but this tarot card resting in this position means you’ve surmounted this last obstacle and are on your way to what you’ve worked so hard for. Down in the trenches, beset on all sides by enemies, hadn’t we gotten past all this? Not quite, but you’re almost there. Protect your position if necessary, and persevere, once this challenge is out of your way, the way will be clear for you to reach your goal. Prepare your defenses, the future holds one final barrier between you and your final successes. You may have unforeseen adversaries working against you, and this is your indicator that you’ll be forced to defend your position one last time to get where you’re going. Fear not though! You are more than capable of facing this challenge. No, now is not the time for this. You are still dealing with a current situation, and the situation about which you ask is an obstacle in the way of fixing your current one. So it’s time to finish up your current things, not move forward. Have you been feeling like there’s no joy left in life? Every day is just the same old grind, one more thing you HAVE to do, one more responsibility, one more obligation? Maybe you’re afraid of making a commitment to whatever project is calling on you. It could be due to the financial aspects or the time you’re not wanting to put towards it, or just feel that your already limited time will be called upon far too much. The Nine of Wands Rider Waite card in inverted position warns you to take special care to examine the situation carefully before discarding it, and make sure you aren’t just being skittish. You’ve been hesitating on joining in on a project, and it’s been knocking at your door for a while. Your fear of commitment has been keeping you from a good opportunity, and it may very well have passed you up by now. Don’t let this fear of committing to an opportunity hold you back in the future. You need to get off the pot, the situation currently in front of you is going to work out for you, if you can ever get over your fear of committing to it. Don’t be skittish, no one is out to get you, and this situation will bring about the thing you hope it will, not the things you fear it will. Coming down the road is an opportunity that you will find a little concerning. You may think it’s going to demand too much of you, or eat more time than you can reasonably afford. Pay special attention, this is probably the opportunity you’ve been looking for, dive into this one! Yes! Not just yes, but ‘yes it’s about time!’ You need to move forward and take advantage of this situation while it’s still available to you. So move, and move quickly, and claim it!